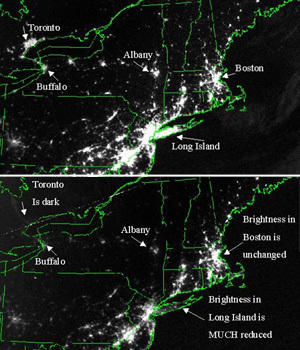 These images dramatically illustrate the extent of the blackout on August 14, 2003. Columbia University feels it is imperative that the development of the new Smart Grid system being developed by Lamont-Doherty scientists be a top National priority. Image Credit: NASA. By 2050, it will take about 30 Terawatt-hours per year (TWh) of electric power to supply the North American economy. A little less than 15 TWh are currently used, with the United States the largest consumer. The “Smart Electric Grid of the Future” must be able to efficiently and securely deliver this two- to three-fold-increase in power to all corners of the continent, in addition to being invulnerable to security breaches, attacks, natural disasters, and mechanical failures. 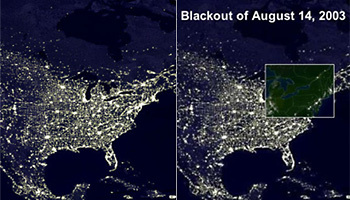 The country can ill afford more blackouts like August 14, 2003. Researchers at Columbia University have assembled a national team of scientists, technologists, security and intelligence experts to spearhead development of this “Smart Electric Grid”—a lean and efficient electrical delivery system that can meet the future energy and security demands of the nation. Dr. Roger N. Anderson and Albert Boulanger from the Lamont-Doherty Earth Observatory, a member of The Earth Institute at Columbia University, along with Rick Smalley, Nobel Laureate from Rice University’s Center for Nano Scale Science & Technology, Ron Oligney, best-selling author of “The Color of Oil” and Director of the Texas Energy Center, and Paul Chu, National Medal of Science winner and Director of the Texas Superconductivity Center at the University of Houston, have developed the framework for a “Smart Electric Grid,” and plans are underway to test their system in Texas as well as the Northeast. “We plan to integrate new technologies with the public policies, economic incentives and regulation changes that will be required to produce the new electric power system. The plan calls for a National Test Bed to put designs and innovations to practical use. A smarter and more capable system is essential to the future of economic growth and vitality for all of North America, and we intend to build the demonstration projects that will show the way to the future grid” said Anderson. The technologies that the Columbia Team are working on will smartly control the complex system associated with the continent’s vast electrical power grid, which must interconnect 200 million asynchronous house, block, community, business, industry, town, and regional generation, transmission, distribution and storage systems. In the immediate future, vast new renewable energy sources from wind, solar, and geothermal power generation must be added to gas, coal, hydroelectric and nuclear sources of the present. The new “Smart Electric Grid” must improve efficiency by 50% or more in order for this power technology revolution to be affordable. In addition, it must be far more sophisticated from a computerized control standpoint in order to deal with unpredictable and time-varying green power sources such as giant wind and solar farms located thousands of miles from metropolitan users. Distributed generation and local power storage at consumer and manufacturing sites must be designed and tested to further fortify Grid stability and safety from terrorism, as well as better defend it from the usual weather and mechanical outages. Columbia feels it is imperative that the development of the new Smart Grid system be a top National priority and that it be open to continual innovation unlike the current electricity system with its limited Research and Development budgets. The Earth Institute at Columbia University is among the world’s leading academic centers for the integrated study of Earth, its environment, and society. The Earth Institute builds upon excellence in the core disciplines—earth sciences, biological sciences, engineering sciences, social sciences and health sciences—and stresses cross-disciplinary approaches to complex problems. Through its research training and global partnerships, it mobilizes science and technology to advance sustainable development, while placing special emphasis on the needs of the world’s poor.